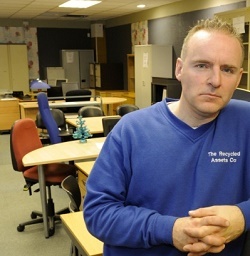 In November The Recycled Assets Company in Portsmouth was burgled twice in the space of 4 days. The first attempt yielded them a haul of just £100 and the second, nothing at all. The company is a social enterprise that employs vulnerable adults to recycle and sell second hand furniture at low cost. Not the most obvious target for a burglary. The reason why we illustrate this particular case is because it clearly demonstrates 3 things: the first is that any business is potentially a target for a burglary: there was no obvious reason to target this company – they don’t carry valuable stock and they don’t take a large amount of money yet they broke in anyway. Twice. The second is that these people have no compassion for the type of business they target: this was a social enterprise that provides employment for vulnerable people supplying goods to low income families so it was tantamount to stealing from a charity. And lastly, it shows that even despite coming away with very little the first time, it didn’t stop them (if indeed it was the same culprits) having another attempt just a few days later. It’s a shocking case on all fronts but serves as a warning to all other businesses that they are vulnerable to being targeted, no matter how low risk they perceive themselves to be. This particular business did not have an alarm or CCTV but they had made attempts to make the door more secure after the first attempt but this was still ripped from the hinges in the second incident. They are now having to invest in a proper electronic security system. The true cost of the break in for this company is much more than the £100 in cash that was taken; repairs to doors and property, the cost of the new security measures, increase in insurance premiums plus the impact it must have had on the people who work there. It’s impossible to say whether this would still have happened if they had had the security system in place but there is evidence that a working alarm and CCTV will usually make a would-be intruder think twice about targeting a premises. Possibly they felt the ease in which they were able to gain access made the risk worthwhile, even despite the poor promise of the likely yield. We may never know but it’s certainly a lesson that other businesses can learn from. If you think that your business is safe without CCTV or even without an alarm we would urge you to reconsider. Even if you don’t have anything of value in your premises, the cost of a break-in can still be high – just ask The Recycled Assets Company. We offer all businesses a free, no obligation security audit. To arrange one call us on 01924 371941.